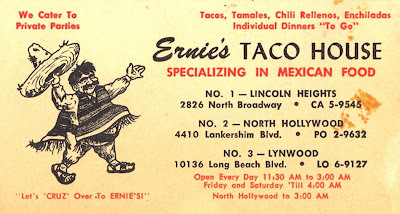 Ernie's Taco House, traditional Mexican eatery in North Hollywood was the 2nd of three locations in the greater Los Angeles area. 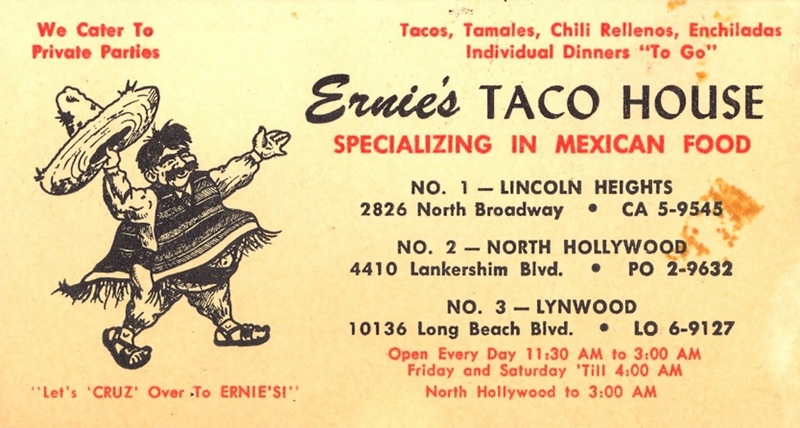 Founded by Ernie Cruz, the North Hollywood location was opened on the 17th of June 1952.
it's still there, another valley icon. Anybody remember what he name of the restaurant was before Ernie bought it. Our family used to eat there fairly often. It too was Mexican. Making tacos is plain fun. One can fill them up with whatever appeals to the taste buds. This is the reason that this Mexican specialty has become very popular worldwide (read about California Save Money With Junk Yards). There is not just one recipe. There are unlimited versions of the recipe that could include many items. You will come across recipes such as Beef Taquitos, Authentic Chicken Tacos, Double Layer Tacos, Beef Steak Soft Tacos, Fish Tacos, Carne Asada Tacos, Salmon Tacos, Grilled Fish Tacos, Shrimp Tacos, Zucchini Tacos, Roasted Vegetable Tacos and many more. You can wrap all those ingredient with some Antistatic Agent for keeping the freshness before put in refrigerator.